Researchers with the CDC say there's been a large difference between the flu season this year and last. In the 2017-2018 season, the flu vaccine had a 25 percent effectiveness against the H3N2 strain. This flu season, there's been a 47 percent effectiveness against all circulating strains. KANSAS CITY, Mo. — Researchers with the U.S. Centers for Disease Control and Prevention say there's been a large difference between the flu season this year and last. In the 2017-2018 season, the flu vaccine had a 25 percent effectiveness against the H3N2 strain. This flu season, there's been a 47 percent effectiveness against all circulating strains. Dr. Gary Slazman with Truman Medical Center in Kansas City, Missouri, said the reason for the higher effectiveness rate is due to more examination on the virus. "I think the research is better and doing a better job of matching the vaccine with what viruses were going to be out, so part of it's a guessing game, you gotta predict what viruses are going to be there," Salzman said. CDC researchers showed a 61 percent effectiveness rate in children between the ages of 6 months and 17 years old who were vaccinated. And while the flu vaccine is working, the season's not over yet. 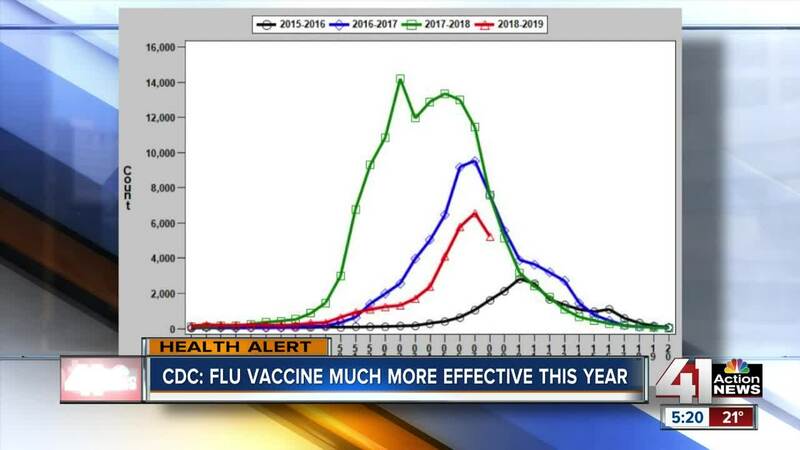 "In Kansas City, we usually see see our peak late in the winter so February, March, so really right now, we're seeing right now we're seeing the peak flu season," Salzman said. "It's still a good time to get the flu shot, you know it works and you certainly don't want to be knocked down with the flu." For a detailed snapshot from your state, click here.